INXS were always one of those hit or miss bands for me, especially by 1985 when I was full throttle into heavy metal. I thought a lot of their 1983 album, “Shabooh Shoobah” album, however, I wasn’t that impressed with what I heard from their follow up album, “The Swing.” Then that’s how my strange mind works. As a result, I wasn’t sure whether or not I should give their 1985 effort, “Listen Like Thieves” a chance. In fact, I must confess that I didn’t actually listen to the album in 1985, it would be a few years later when I was treated to it. I realized then that this was a pretty decent album. 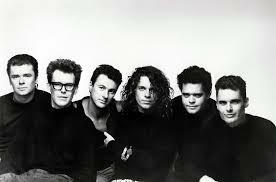 So-called experts claim that the three singles released from the album represented INXS’s move to being a more singles band. However, while “What You Need,” “Listen Like Thieves” and “Kiss the Dirt (Falling Down the Mountain)” all charted in the band’s native Australia, only the first one charted in the US. I’m not sure how they did anywhere else. This adds to my paradox in regards to them. Three singles from an album would have led me to brand them a top 40 band back then but the fact only one song actually reached that plateau in the US convinces me they weren’t and makes me like them more. Now as most of you already know, I don’t judge an album by its singles and it’s the rest of the album I was most interested in. Fortunately, the rest of the album doesn’t disappoint. “Shine Like It Does” continues the fusion of new wave and hard rock and “Biting Bullets” gets my vote for hidden gem on the album. It has a catchy rhythm with a hard rock edge and the keyboards support the song and add an extra dimension to it. “This Time” has an intro that would sit well with a heavy metal song and though it’s not metal, the band makes good work of things with it. 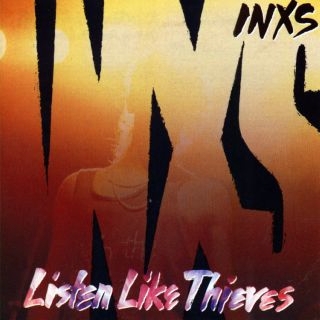 With nearly all of the songs, INXS employ a catchy melody that goes well with the guitars and new wave sound. Sure, there are keyboards but they are in no way synth pop and it makes things that much better. The only song that doesn’t really do it is the instrumental “Three Sisters” but there’s enough there on that one that I still will listen to it. It’s almost the same story with “Same Direction,” except it does have a catchy chorus and a nice little guitar hook. The rockiest song, however, is the closer, “Red Red Sun.” It seems here that INXS were determined to go all out in the end and they do it quite well here. There are no solos but some good guitar hooks on it, so it’s a great way to end the album. This is a case of appreciating now what I didn’t appreciate back then. Fearful to take the plunge, I had to wait a few years to see what a good album “Listen Like Thieves” actually was. Fortunately, this is also a case of all’s well that ends well.